How to add Tagalong Categories using a Gravity Form | De B.A.A.T. With GFI it is possible to add a new SLP Location using the input from a Gravity Form. For this we assume you know how to set up the form and use the GFL Mapping to do this. In the GF Form, add a “Multi Select” field. 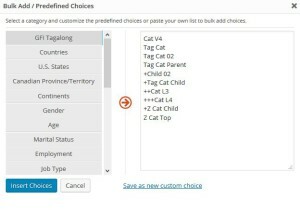 Configure the Multi Select field to show the Tagalong Categories using the button “Bulk Add / Predefined Choices”. 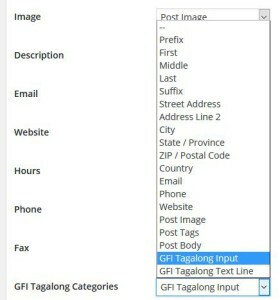 GFI has added a new “GFI Tagalong” option to the list of predefined choices. Create or update a GFL Mapping for the Form with the Multi Select field. In the GFL Mapping, link the new Multi Select input field to the GFI Tagalong Categories field. Use the Form on a post or page to create new locations. Select one or more Categories in the Multi Select field to assign them to the location created.